From the Greek word kosmos, meaning orderliness, hence an ornament or beautiful plant. The brilliant semi-double flowers of scarlet red are often brushed with deeper red, and have the habit of tipping this way and that, lending an informal air to your garden. Compact free flowering and easy to grow. Self sows. 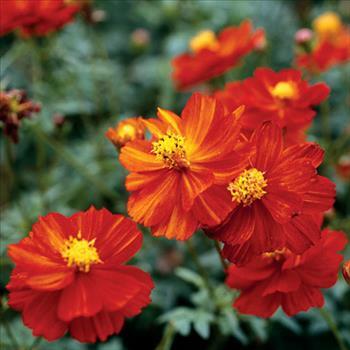 These floriferous cosmos are great in butterfly gardens, containers and the border. 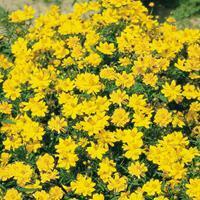 Drought tolerant, they are often added to less managed meadow plantings in drier soils. Shear after the first flush of bloom to encourage a rebloom, or replace with a quick blooming annual. Fertilizer: Cosmos do not need rich soils, and may sprawl in nitrogen rich soils. The specific epithet sulphureus means sulfur-yellow.